Q. How can I check the status of my Library Express requests? If you have submitted requests for articles or books through your Library Express account, please be sure to keep an eye on your e-mail as we will communicate with you on the status of your requests through your EKU email. You can always check on the status of your Library Express requests, by logging in to your Library Express account. You will be prompted to log in using your EKU username and password. 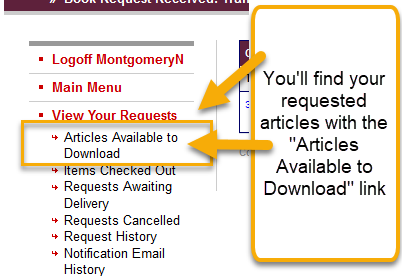 Once available, your requested articles will be available for 30 days under the Articles Available to Download link. Review your Outstanding Requests to check on the status of books and articles that you requested. Tip! Please don't forget to allow adequate time for delivery of materials. Depending on the nature and availability of your requests, there may be an extended waiting period. If you have any questions regarding your requests, don't hesitate to contact Library Express at express.library@eku.edu or 859-622-1415 during University office hours.